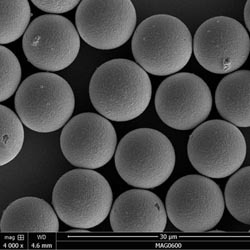 Monodisperse microspheres have high sphericity and a very tight particle size distribution, often with CV<10% and specification of >95% of particles in size range. 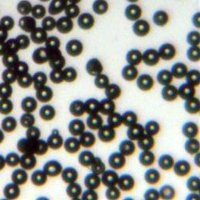 Monodisperse particles are often used as as calibration standards and tracer particles for qualifying medical devices and in many biotechnology applications. Monodisperse silver-coated silica microspheres offer a high performance conductive spacer for specialized applications. Spacer grade beads and microspheres are specifically designed with a sharp maximum diameter cut-off to control bond-line thickness (gap thickness) of an adhesive layer. For this application, the customer will mix these microspheres into the desired adhesive. Just a small amount of spacer beads can create a controlled gap as well as precisely define and maintain specified bond-line thickness. Even though most of Cospheric particles would work for this application, spacer grade was specifically developed for those customers seeking extra tight bond line control. Glass and silica spacers offer the extra benefit of high crush strength, resistance to most solvents and high temperature performance. Bond-line spacers are used in many industries including gas plasma displays, automotive mirrors, electronic displays, flip chip technology, filters, microscopy, and electronic equipment.